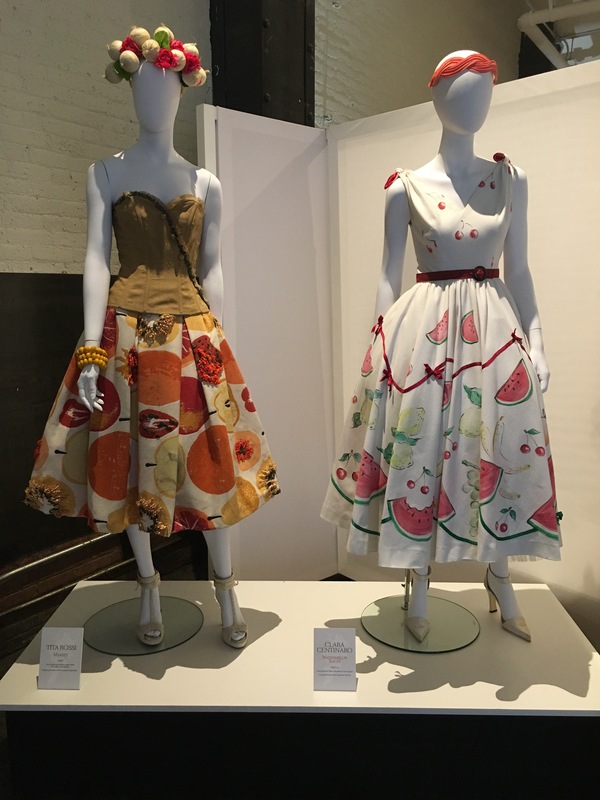 L’Eleganza del Cibo exhibition at Chelsea Market features an ensemble of 58 haute couture and prêt-à-porter dresses created by both iconic and emerging designers from 1950-2016. The exhibit explores the connection between Fashion and Food, eco-sustainability and energy while celebrating the creativity of Made In Italy. Featured image: Moschino – Neapolitan, 1991. White poplin printed shirt featuring Naples and the phrase ‘In Pizza We Trust’. Italo Marseglia – Air Clouds, 2014. 10 dresses created with over 500 yards of tulle. Nicola Zecca – Grapes, 1949 silk twill dress with hand embroidered velvet grapes. Christian Dior by Irene Galitzine -Berry and Flower, 1953 ivory silk organza wirh hand-embroidered flowers and fruit. Tiziano Guardini – Terra (Earth), 2014 sculptural dress made with flowers. Gattinoni -Bread Dress, 2015 bustier sculpted with wheat sheaves, jute pants embroidered with glazed crackers and biscuits. Kukso Koo – Lunch Is Ready, 2015 embroidered and hand painted linen dress with pasta and peppers. Alessandro Consiglio -Apples and Cherries, 2002 cocktail dress with vacuum sealed apples and candied cherries. 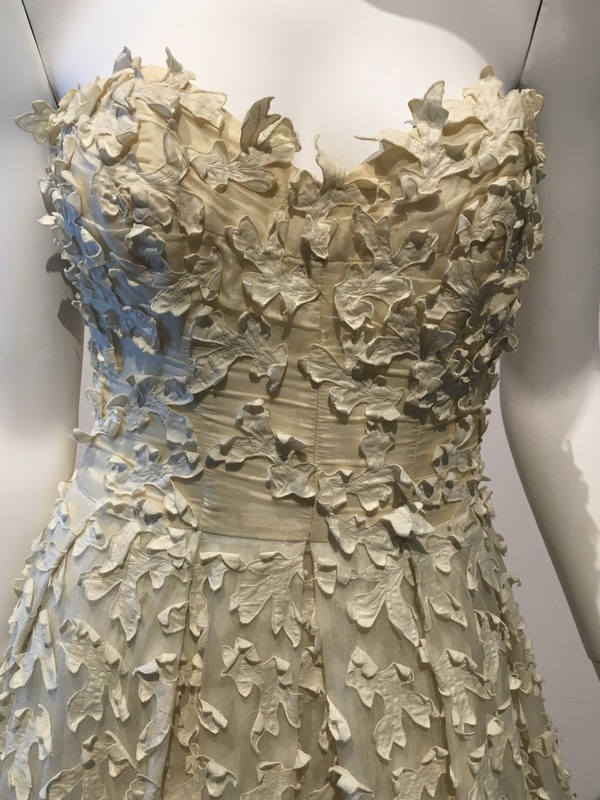 Alessandro Consiglio – Pop Corn, 2002 wedding dress decorated with vacuum sealed popcorns. Maria Maiani Academy – Salad, 2016 taffeta dress with felt and paper embellishments. Raniero Gattinoni – Vegetables, 1989 one-shoulder dress in various shades of draped green chiffon. Carta E Costura – Cabbage, 2015 French coat, cabbage leaf motif printed on green background. Giorgio Armani – Bamboo, 2015 multi-layered dress in silk jacquard with bamboo embroidery. Romeo Gigli – Crystals, 1999 pure silk dress with paper embellishments. (First two dresses & last) Enrico Coveri – Ice Cream, 2013 silk tricot knit dresses with sequin embellishments. Odile Orsi and Fabrizio Talia – Fruit Salad, 2015 hand painted silk crepe and embroidered organza dress. Raffaella Curiel – Tribute To Caravaggio, 2015 printed taffeta dress. A-Lab Milano – Salad, 2015 duchesse cocktail dress in printed fabric and silk gauze with neoprene details. Valentino -Walnuts, 1968 walnut print fabric. Irene Galitzine – Coral, 1965 embroidered palazzo pajama. Tita Rossi -Market, 1959 jute corset and printed cotton dress with raffia embroideries. Clara Centinaro -Watermelon Slices, 1950 hand-painted dress.